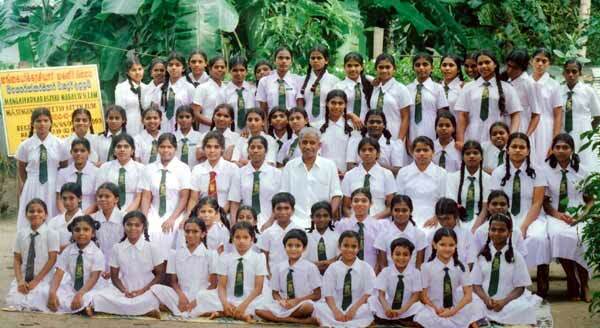 As a result of civil conflict in Sri Lanka from 1983, most of the people suffered horrifically. Very many families, mostly from the backward villages, lost their belongings, houses, and land. Bread winners of countless families have been either killed or rendered disabled. Among them many children became orphans. These children who lost their parents with no one to look after were on the street without proper food, clothing, and shelter. A majority of the affected children are found to be from remote villages, where 75% of the families are below the poverty level. Having realized the pathetic situation in most intense areas of conflict, some Hindu organizations and well-wishers joined together and brought into existence the Mangayar Karasiyar Mahaliar Illam on 5 October 1988. 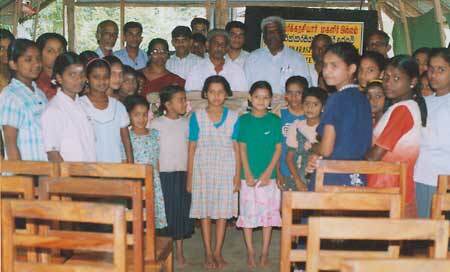 At the initial stage the "Jaffna Saiva Vidya Abyviruthi Sangam" donated Rs. 25,000 and started the home in a rented house at Urani within Batticaloa municipal area, with five children. Thereafter on 23 June 1990 the Home was shifted to another rented building at No 16/1, Sengunthar Veethi, Thamaraikerny, Batticaloa. The number of girls aged 8 to 18 has since then grown to 51. Although there are very many deserving children seeking admission to this home due to lack of accommodation and funds, admission is limited, until a permanent building for the society is completed and financial position is stabilized. Due to the continuing war, destitute children are on the increase and we receive applications to this home from Amparai, Trincomalee, Pandiruppu, Batticaloa, Pottuvil, Valaichchenai, Muthur, and Kalmunai. It is an impossible task for this organization to shoulder such a large responsibility on account of non-availability of a proper building and sufficient funds to meet the maintenance expenses. To inspire displaced children to concentrate on religious faith in order to regain self-respect and confidence and to awaken the dormant power of love to overcome trauma. It is the wish of the management that all eligible destitute children irrespective of cast or creed be admitted and looked after. As education is considered as primary importance, promoting education to the destitute children will produce a paramount role for their lives. At the moment the administrators concentrate on consolidating on a programme to help the affected children of this home to help regain the will to live. preparation of food items, viz. sauce, prickles, chutney etc. This home is maintained purely from contribution and donations received from well - wishers, benefactors of the underprivileged children of this home. The voluntary contribution now being received is not on a permanent basis. However kind hearted and sympathy have come forward to help in several ways. The management of the organization depends on guidance of well-wishers and benefactors. Follow up depends on aiding sources. The management will be active on up keep of responsibility placed on them. Maintenance of this home for a month amounts to Rs. 150,000, details as follows. Donation from the generous organizations, well-wishers and philanthropists have helped with positive assistance. We are seeking the cooperation of every citizen of intellectual level, societies and associations to help these needy displaced children of this home anxiously who are anxiously awaiting a better future. It is only through the service that our love towards needy express itself in action. (Late) Mr. V.T. Kumarasamy, B.A.